The presence of gold in the Rocky Mountains had been rumored in the United States since the Mexican-American War and the gold rush to California. But, when a few small gold nuggets were found in Clear Creek in 1859, the cry “Pike’s Peak or Bust” swept the nation, and the “Rush to the Rockies” began in earnest. 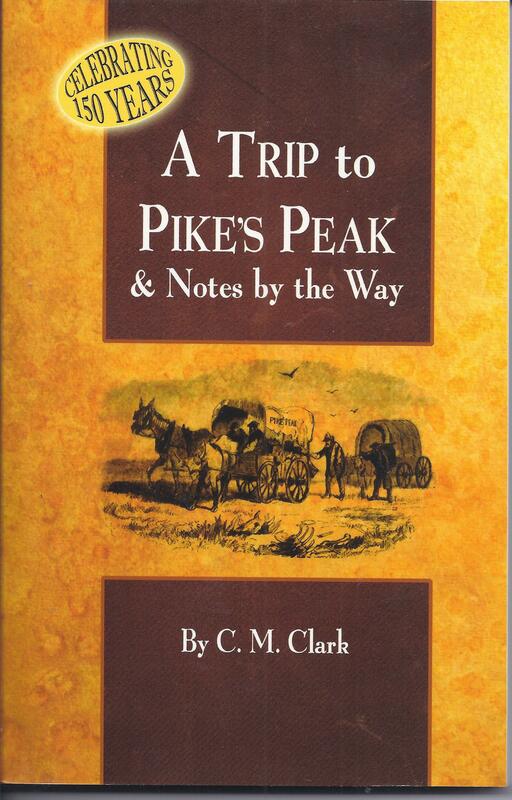 A Trip to Pike’s Peak & Notes by the Way – perhaps the best contemporary account of “The Pike’s Peak Gold Rush” —150 Years ago and counting. Clark’s book tells in detail what it was like to be on the dangerous trail to the new “diggings,” which took him forty-five days using oxen to pull his wagon. Then he discloses his observations on where the gold lay and why most prospectors didn’t find it. Although revised for easier reading, the editors endeavored to keep the “flavor” of Clark’s original tale. Illustrations from many other sources have been added to enhance the original story. This book will give you a true feel of what it was like to be a ‘59er.